The iPhone X is almost here, and Apple’s PR machine is working overdrive. This year round, Apple is eager to amplify the positive response to the iPhone X, and has produced a picture of the phone which mimics the style of a movie poster, and shows the reaction to the device from those lucky few journalists who have had a chance to try it. 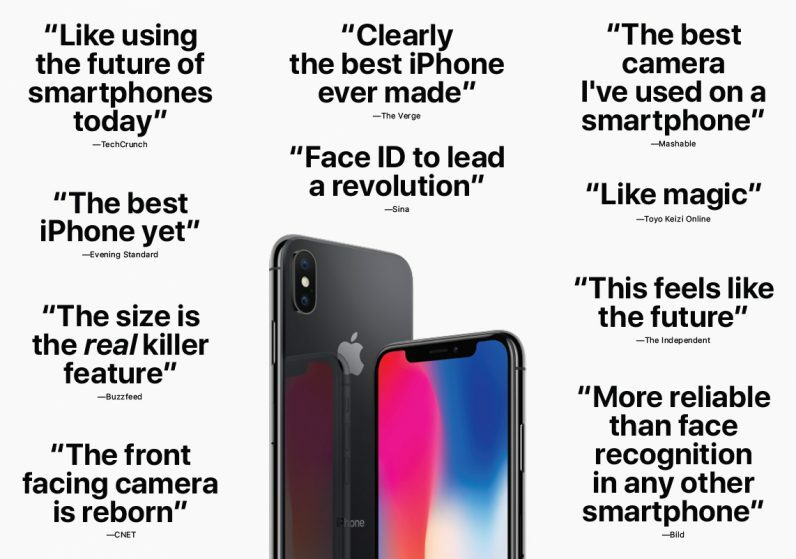 The company also published a blog that prominently features flattering quotes from publications who have reviewed Apple’s new handset. Review roundups tend to be the preserve of the press. Searching google for “iPhone review roundup,” and you’ll see articles from the likes of The New York Times, The Guardian, and 9to5Mac. It’s unprecedented for Apple to release its own. You can look at this in a couple of ways: the first is through the prism of the iPhone X being a radically new phone, which departs from nearly all established iPhone conventions. Emphasizing the (largely positive) response to the device is a great way to frame this as more than just a moonshot device, but rather the pinnacle of Apple’s mobile history to date. It can also be perceived as an indication that Apple is revisiting its entire PR strategy. In addition to this, the company is also engaging with YouTubers as part of its outreach efforts — which, admittedly, has frustrated some of Apple’s more stalwart enthusiasts in the established tech press, most notably Daring Fireball’s John Gruber.